Firstly Kathryn, two very important questions. I love a coffee in the morning or mid afternoon and currently love Costa's Caramella! But I am Northern Irish so I will never say no to tea! My name is Kathryn, I am 22 and I live in Northern Ireland. I have just finished a degree over in Derby studying Criminology. In my final year I developed a love for crafting again and started up a craft blog. By the end of my degree I realised my dream job was not what I thought it would be so I looked at other options and decided to try and start my own business! During the last two months I have taken a short business course and now I am preparing to dive in to full time selling hopefully in September! Eeeek! These are some of my 'to-do list' notebooks. I have been working on this for quite a while and the idea came originally for a friend who is getting married. I made her one of the books to write all of her bridal to-do lists in! 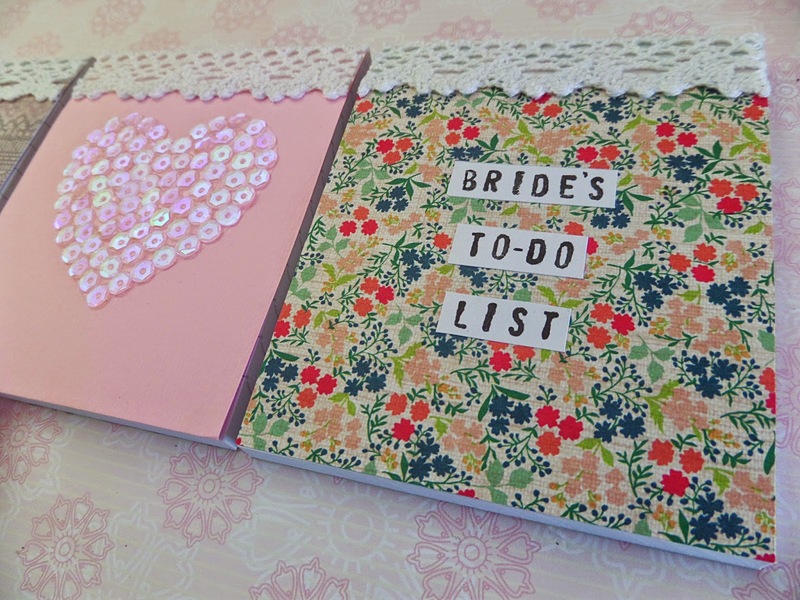 I have made some plain designs and some for bloggers too... As I am always writing lists for my blog! I studied a BTEC National Diploma in Art and Design and learnt a wealth of information on that course, art and craft related. I feel lucky to have been able to dip my toe in so many art subjects which is why I started my blog as I always like to teach people new skills. I am always looking to upcycle and save my pennies so this is another reason why I enjoy crafting! When did you start Cheerfully Cheap Chick and Bhilee Designs and why? I love seeing people enjoy the gifts I make for them as I try to make gifts that a personal and special. I also thoroughly enjoy interacting with other crafters online and I feel it is a wonderful community to be part of. No I wouldn't say so - I like a bit of everything. Yes, I now have a little room to craft in. I was never productive when I crafted in my bedroom. To start my little business and hopefully be successful! Thank-you for listening to me ramble! I would love to hear from anyone who sells their crafts and how they find it, good or bad! And thank-you again Mrs Crafty B for having me. Thank YOU Kathryn. I think we would get on well and I especially enjoyed seeing what your favourite word was. Makes me laugh every time he he. Come back again once you've stocked up your shop and let us all know! Don't forget to find Kathryn online and watch this space. We all need a to-do book!